Due to the continuous resources’ reduction and cost increase of conventional fossil fuel along with the global trend to decrease the greenhouse effect, clean energy production from renewable sources has been given a global great concern. Among renewable energy sources, wind energy conversion systems have received a worldwide notable attention. It is expected that more than 10% of the global electricity demand will to be generated by wind energy conversion systems by the year 2020. During their early implementation stage, wind turbines were to be disconnected during abnormal and fault conditions within the electricity grid it is connected to. Owing to the fact that current wind installations supply a significant portion of the load demand, disconnecting windfarms may lead to business interruption and discontinuity of power supply to the end user. As such, transmission line operators have developed strict grid codes that wind turbine generator must meet to maintain its connection to support the grid during various fault conditions. To comply with these codes, flexible AC transmission systems have been widely used with current wind energy conversion systems to modulate reactive and/or active power at the point of common coupling of the wind turbine generator and the grid. 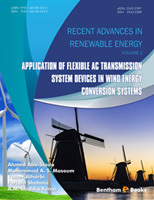 This book presents the applications of various flexible ac transmission system devices to wind energy conversion systems. Devices such as unified power flow controllers, superconducting magnetic energy storage and static synchronous compensator are covered in this book. Topologies, control systems along with case studies of the aforementioned devices are presented and discussed. This book will be useful for postgraduate research students, upper-division electrical engineering students and practicing engineers.